I’m a geek at heart. Lover of words and thirsty learning, hearty laughter and silly faces. I’m on what seems like my fourth lifetime. It’s about the journey, right? Which is good because I’m not sure what the destination is. As the saying goes, I’m just moving forward. I am writing this daily blog because suddenly, my life had become filled with too much negativity–in the news, in the office chatter, in the lives of friends. I was finding myself pulled further and further from my natural optimism and longed for balance. I truly believe that is the key to healthy living. Balance. So in order to cancel out the negative around me, I knew I needed to find the positive. That is my quest; this is my gratitude journal. It’s a challenge to myself to look for the positives around me. Daily. Not just notice them in passing, but to see them and write them down. For the next year, that is my plan. Because I’m starting from the negative, I’m sure it’s going to be difficult. I’m going to get lazy or complacent or down or up or too busy to want to take note and set the good into words. But I’m going to try. I imagine some days will be great big gratitude days where amazing things will happen, while other days I may simply be grateful that the day is over. It should be interesting. And at the end of this, I hope I’ll at least be a little more observant of my life. That, my friends, will be a good thing. It’s my life; I’d hate to miss it. 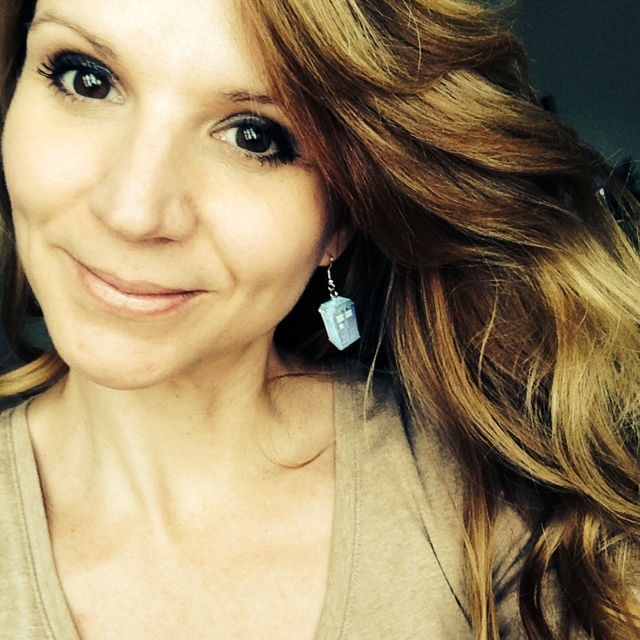 Me and my Tardis earrings. Dr. Who, anyone?